Netdata registry implements the my-netdata menu on netdata dashboards. The my-netdata menu lists the netdata servers you have visited. due to the resources required, the number of metrics collected is limited. for the same reason, the data collection frequency is not that high, at best it will be once every 10 or 15 seconds, at worst every 5 or 10 mins. the central monitoring solution needs dedicated resources, thus becoming "another bottleneck" in the whole ecosystem. It also requires maintenance, administration, etc. most centralized monitoring solutions are usually only good for presenting statistics of past performance (i.e. cannot be used for real-time performance troubleshooting). Using netdata, your monitoring infrastructure is embedded on each server, limiting significantly the need of additional resources. Netdata is blazingly fast, very resource efficient and utilizes server resources that already exist and are spare (on each server). This allows scaling out the monitoring infrastructure. However, the netdata approach introduces a few new issues that need to be addressed, one being the list of netdata we have installed, i.e. the URLs our netdata servers are listening. To solve this, netdata utilizes a central registry. This registry, together with certain browser features, allow netdata to provide unified cross-server dashboards. For example, when you jump from server to server using the my-netdata menu, several session settings (like the currently viewed charts, the current zoom and pan operations on the charts, etc.) are propagated to the new server, so that the new dashboard will come with exactly the same view. For each netdata installation (each machine_guid) the registry keeps track of the different URLs it is accessed. For each person, the registry keeps track of the netdata installations it has accessed and their URLs. For each URL, the registry keeps the URL and nothing more. Each URL is linked to persons and machines. The only way to find a URL is to know its machine_guid or have a person_guid it is linked to it. Who talks to the registry? What data does the registry store? For persons and machines, the registry keeps links to URLs, each link with 2 timestamps (first time seen, last time seen) and a counter (number of times it has been seen). Which is the default registry? https://registry.my-netdata.io, which is currently served by https://london.my-netdata.io. This registry listens to both HTTP and HTTPS requests but the default is HTTPS. Can this registry handle the global load of netdata installations? Yeap! The registry can handle 50.000 - 100.000 requests per second per core (depending on the type of CPU, the computer's memory bandwidth, etc). 50.000 is on J1900 (celeron 2Ghz). 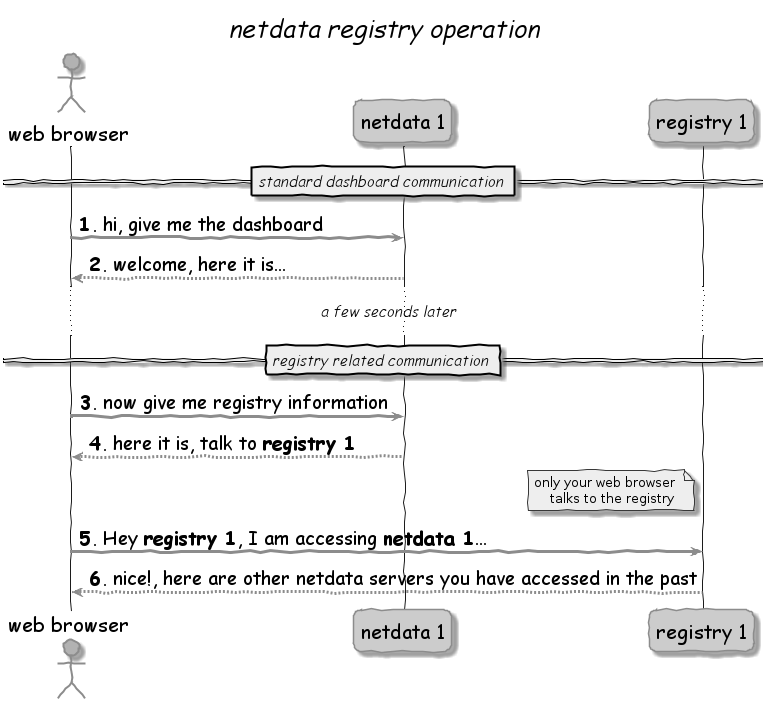 Every netdata can be a registry. Just pick one and configure it. Restart your netdata to activate it. Note that we have not enabled the registry on the other servers. Only one netdata (the registry) needs [registry].enabled = yes. This is it. You have your registry now. So this server will appear in my-netdata as Group1 - Master DB. The max name length is 50 characters. allow from settings are netdata simple patterns: string matches that use * as wildcard (any number of times) and a ! prefix for a negative match. So: allow from = !10.1.2.3 10. * will allow all IPs in 10. * except 10.1.2.3. The order is important: left to right, the first positive or negative match is used. Keep in mind that connections to netdata API ports are filtered by [web].allow connections from. So, IPs allowed by [registry].allow from should also be allowed by [web].allow connection from. Where is the registry database stored? all incoming requests that affect the registry are saved in this file in real-time. every [registry].registry save db every new entries entries in registry-log.db, netdata will save its database to registry.db and empty registry-log.db. Both files are machine readable text files. The registry URL should be set to the URL of a netdata dashboard. This server has to have [registry].enabled = yes. So, accessing the registry URL directly with your web browser, should present the dashboard of the netdata operating the registry. This error is printed on your web browser console (press F12 on your browser to see it).